It was a two-plow snow yesterday. As the snow softly and slowly fell into the night, the wind did its work to create beautiful sculptures. This is the kind of snow made for childhood fun. The fort-making type to be sure. It stops and detaches you from the complexities of the day to enter into the playground and gallery of nature. Like it was last week, I remember the delight when a snow day was declared. We geared up in polyester snow suits, hats, mittens and moon boots to make our way out to create our own sculptures of snowmen and angels in the fresh frozen fluff. Skating for hours, sliding down dead man’s hill until dark. A serious snow that keeps you in the house until they plow the streets and that you snow blow the driveway a few times to keep ahead of it. 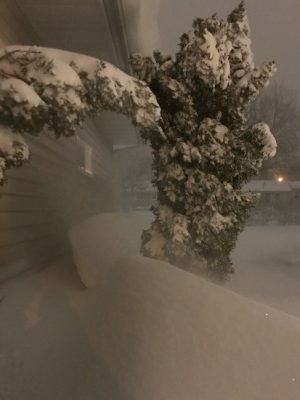 And, of course, right when you are done, the snowplow drives by and creates a two foot barrier of heavy thick snow that triggers the snow blower again. Adrift for but a while to be transported back to the simplicity and delight of childhood. To that feeling that remains in us and need only be awakened with a beautiful deep snow. A place to return to often even without the snow. Nature. Art. Play. Joy. Adrift.